Terraced two bay, ashlar cut stone, three storey stone building built in 1851, having two shallow elliptical archways over the ground floor windows/doors. 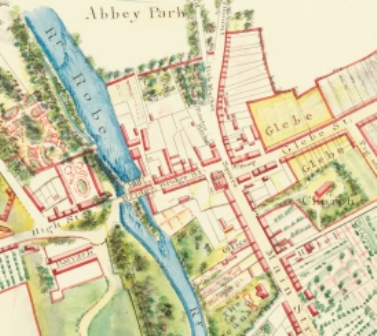 The building on the right appears to have been added on at a slightly later date with one bay over a slightly ovoid archway, formally the Brown’s business and later Peter Hughes’s where he ran a hardware and gift shop with his wife Shelia (nee Brown). In the Ballinrobe Chronicle of September 1892 it states that "Mr. Pat Browne is rebuilding his house on Main Street for £730." Shops had one or two large windows depending on the size of the shop. Many Public houses had a different section to the front which was the case here. You walked in the door and the grocery section was at the front of the shop, with a pub at the back - usually a wooden division separating both. In some cases the Grocer or Publican may have had a field or more behind the building where cows were milked and the milk was sold to those who would bring in their milk cans. If this was the case, then the owner could also be described as a Dairy man. Most business people had more than one occupation. The Publican was often also the Grocer and possibly an Auctioneer also. 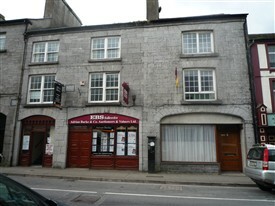 Other shops close by in Ballinrobe contained the Saddle Makers and Harness Makers, the Shoe and Boot Makers, Blacksmiths, Feather dealer, Ironmongers, Apothecary (instead of the modern pharmacies with their pre made pills etc), Tallow Chandlers and their candles, Brewers, Tanners and their tan yards, Coopers and Millers and Millwright plus the Tailors. According to Mr. Oliver Brown his ancestors were the first to sell bicycles in Ballinrobe and they also hired out bicycles when required. 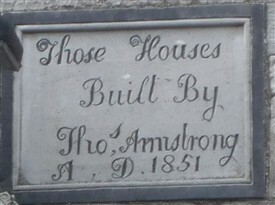 According to Lewis’s Topographical Dictionary of Ireland, l837, Ballinrobe “consisted of one principal street, from which two others diverge and contained 441 houses.” These were of handsome appearance, well built and slated. The population in 1841 was 2,678 and 488 houses were inhabited. The l851 census showed a slump in the total number of inhabitations to 327. In architectural terms Ashlar is smooth square or rectangular stones laid in a horizontal fashion with mortar; used for foundations or facing of masonry walls. Charles Allen Armstrong was my great grandfather.